Norman Filter Company's 4100 Series filters is a compact, lightweight t-type filter that provides reliable and economical protection for critical testing equipment, valves, gauges and instrumentation. Designed with high dirt holding capacity pleated elements are available in two compact sizes for use in low flow, high pressure situations. All t-type filters are constructed from 316/316L stainless steel and have a pressure rating of up to 15,000 PSI and up to 2.5gpm. 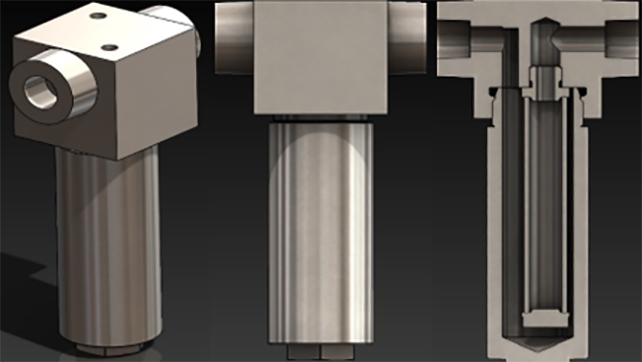 Mini-Ts are commonly used in point of use applications as well as heavy use in chemical injection in offshore oil and gas, as well as alternative fuel systems with high pressure hydrogen. No media migration due to the use of 304 stainless steel microweave wire mesh. Stainless Steel microweave mesh 9 micron ratings from 10 to 300 micron. Stainless Steel Sintered .5, 1, 3 and 7 micron absolute. Random Metal Fiber (metal fiber felt) available in 3, 5, 10, 25, 40 & 75 micron. Microglass ratings 3, 5 and 10 micron absolute.